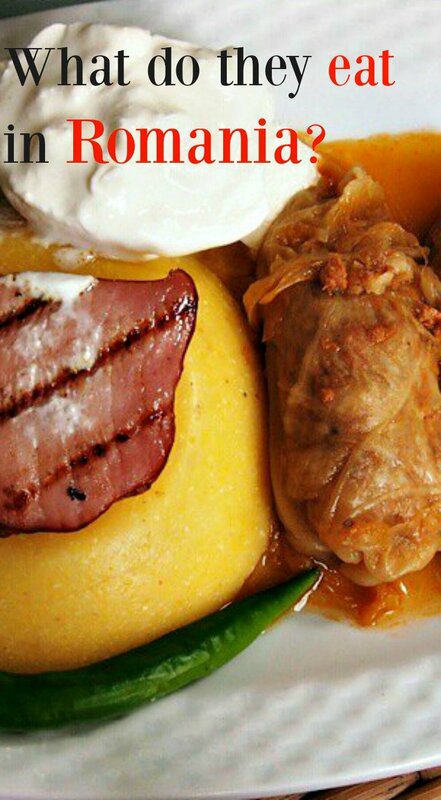 Want to find out about traditional Romanian Food? It’s not just meat and potatoes. We were really happily surprised by traditional Romanian foods when we first arrived in Bucharest over 4 years ago. 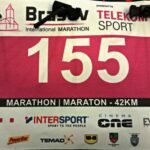 We immediately hunted down as many Romanian dishes as we could, eager, as always, to find the real food of the country not the multinational cuisine on offer in this modern city. Bucharest is bursting with bars and eateries, you can eat pizza, tapas, Thai, Mexican, anything you like, but we wanted to taste Romania. 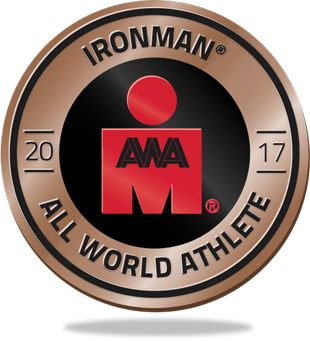 We found it in the capital and also in the remote Romanian village that we called home for the next 3 years. 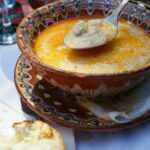 I’ve cooked and eaten with farmers, shepherds and mothers, these are the dishes we loved most in Romania. 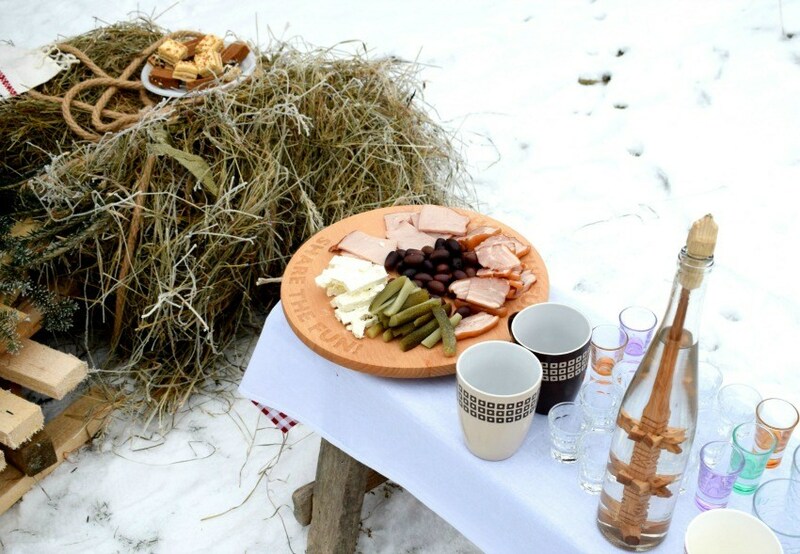 A beautiful local platter of food and drink at Christmas time in our village. This little spread was put out in the snow to welcome carol singers, it was around -9 C on this morning. We visited Romania and fell in love back in 2015. We’ve spent most of our time there since, trying to integrate into an incredible rural village in Maramures County. But that is another story, back to the food. 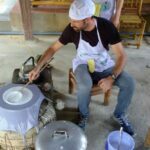 Since those first few restaurant meals in Bucharest we’ve eaten many home cooked, delicious Romanian feasts, usually in small hotels, but sometimes in village homes from the big cities to rural Maramures. The food is good, hearty, stick to your ribs stuff and packs a powerful flavour punch. I have even taken a Romanian cooking class or two, from housewives, the real experts, happy to share the Romanian foods of their childhoods. Being a vegetarian in country Romania is hard, just about all of the traditional dishes are meat based. Being a vegan is even harder, milk,butter, sour cream and cheeses are big players too. If you have a dairy allergy you could struggle with eating out, but my wife found that she could eat the goat and sheep’s milk cheeses available in Romania. That said, Romanians sometimes take a meat free fast prior to religious festivals ( Easter) , so vegetarian dishes do appear on local menus. Traditional Romanian Foods to Look Out For and Try. Our landlady at this country farm stay would cook us a different soup every day, each one was delicious and a meal in itself, but we then had to make room for a main course and dessert too. This part of the world produces some fabulous soups. Romania is rather fond of tripe so tripe soup, ciorbă de burtă, often appears. I’ve tried it, the soup is great, but I can’t eat tripe on a regular basis. It’s just not for me but Romanians love it. Look out for Ciorbă de perişoare, meatball soup and ciorbă ţărănească , vegetable soup, with or without meat. 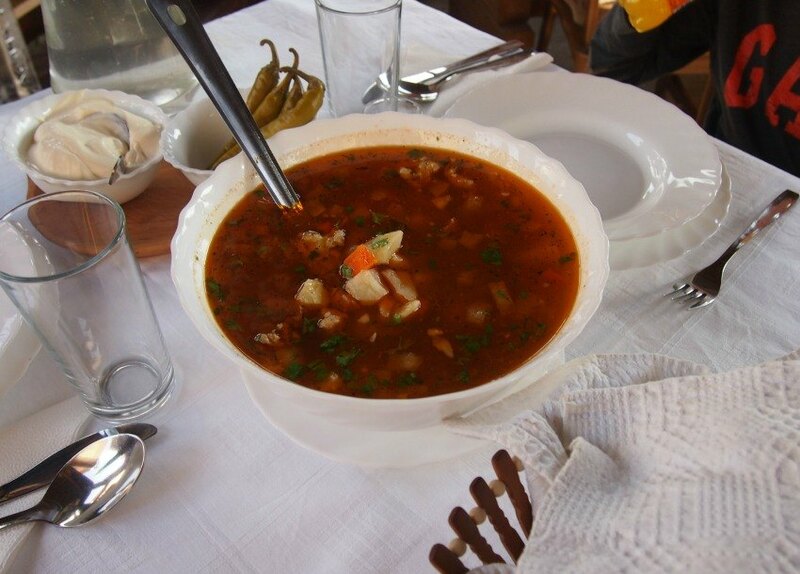 Goulash soup is common in Romania too, and extremely good. Traditional Romanian sarmale with polenta and a slab of pork. This is a celebration dish and these fiddly cabbage rolls are hand made by local cooks in our village. The filling is rice and more pork. The pig is king of the Romanian table. As Christmas approaches the pig slaughters happen daily here in the country. Housewives will be busy preserving pork and pig fat ( slanina) and preparing sausages and other tasty treats. Easter is the only time you really see lamb on the menu, spring lambs are stuffed whole with offal, eggs and onions to make traditional Easter lamb. Try Tocaniţă (or tochitură ) , a tasty meat stew . My favourite dish, sarmale, pickled cabbage leaves stuffed with a mixture of minced meat and rice then braised in a pot. Yor sarmale usually come with a dollop of sour cream (smantana), a serve of polenta and a crisp fresh or pickled chili. Papanaşi are like donuts filled with sour cream and topped with fruit preserve. Clătite cu brânză are crepes filled with cottage cheese, raisins and spices. Cozonac is rather like stollen. It’s a traditional holiday sweet bread, rolled and filled with walnuts, poppy seeds or cream cheese. You’ll see this in the supermarkets, but home made is better. 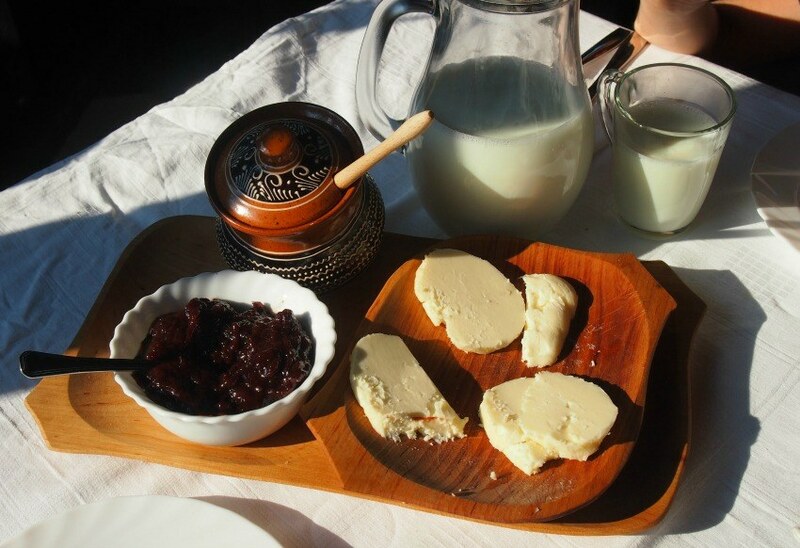 A quality Romanian breakfast, from the orchard, the dairy and the bee hives. Cheese is as likely to be sheep, goat or cow and is sometimes served fried. Some hotel and pensiunea breakfasts have been outstanding, like this one in Maramures, featuring dairy products straight from the cow, home made jam, honey, tomatoes, cucumbers and a hot dish. Others have been rather average, processed cheese and sausages. It’s well worth hunting down hotels with great breakfasts. 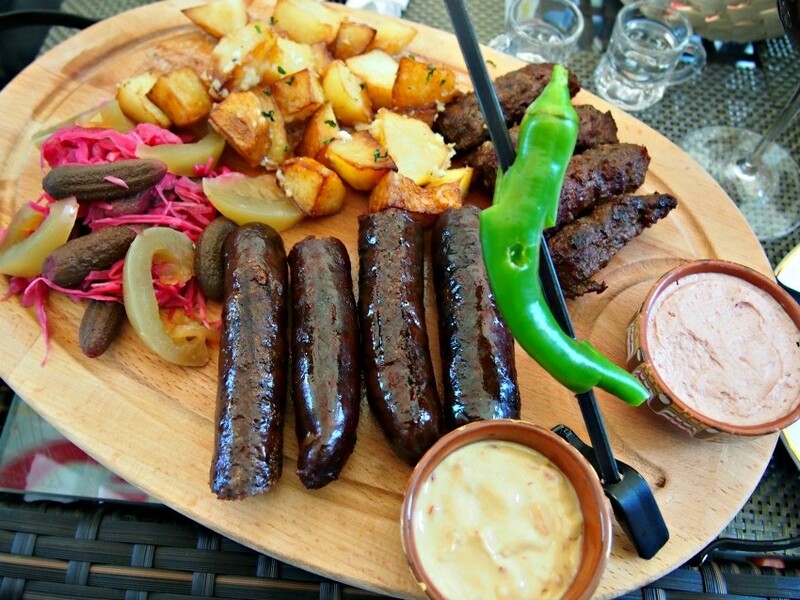 This Bucharest restaurant meal was a special sampler of venison sausages, mici and pate. Pickles, a crisp green chilli and mustard complete the feast. Just about any dish can be enhanced by a dollop of sour cream (smantana). Expect to see a green chili on the side of your plate too, either fresh and crispy or pickled. You will see a lot of pickled vegetables, traditionally summer’s vegetable harvest had to be preserved for the harsh winters, you’ll still see that tradition in restaurants, markets and stores. Mustard is an art form in Romania, but don’t be surprised to also see tomato ketchup, either sweet (dulce) or picante. Wherever you go in Romania you will find a stall cooking Mici . These little skinless sausages can be made of mixed meats and generally come with a chunk of country bread and a very generous serve of mustard. 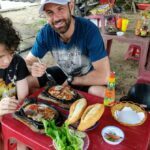 You can find street food such as this at markets and often outside supermarkets. 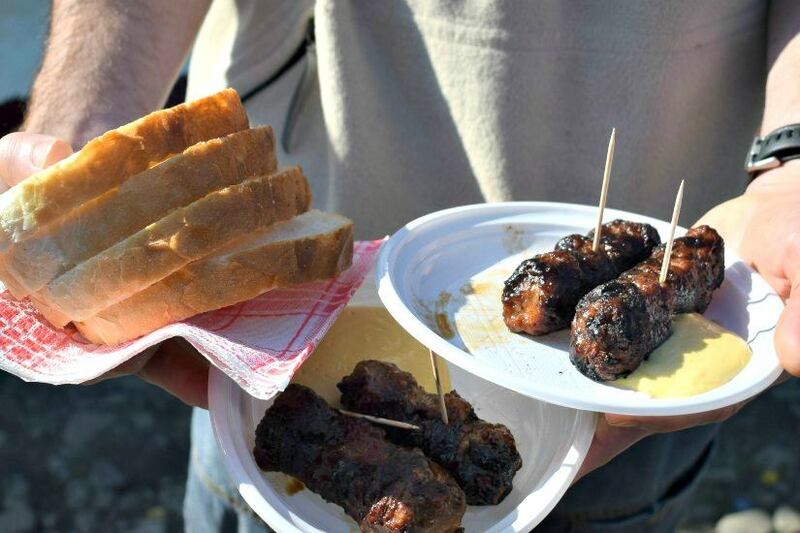 On the streets and in country markets you will usually be able to find a stall cooking mititei or mici ( the name means little ones, or little boys). Order a plate of these tasty skinless sausages along with a slab of bread and a huge dollop of mustard. Placinta, (from the Latin word, placenta, cake) came to Romania with the Romans. It’s a pastry or cake that can come sweet or savoury. My boys like it with Nutella, I like it with sheep’s cheese ( telemea, similar to feta). Kurtoskalacs, (or chimney cake) stalls can be found at markets, on the ski slopes, even outside most supermarkets. These tall cylinders of sweet yeasty dough can also be found in Hungary. The home stay/ guesthouse/ hostel we used in Bucharest is this one, Swallows Villa, it has private family rooms with en-suite. We recommend using Hotels Combined to search for your accommodation in Romania and usea Lonely Planet Romania Guide Book, you may need some assistance from their language section. We generally fly into Romania using Wizz Air, but check prices, best deals and availability first. 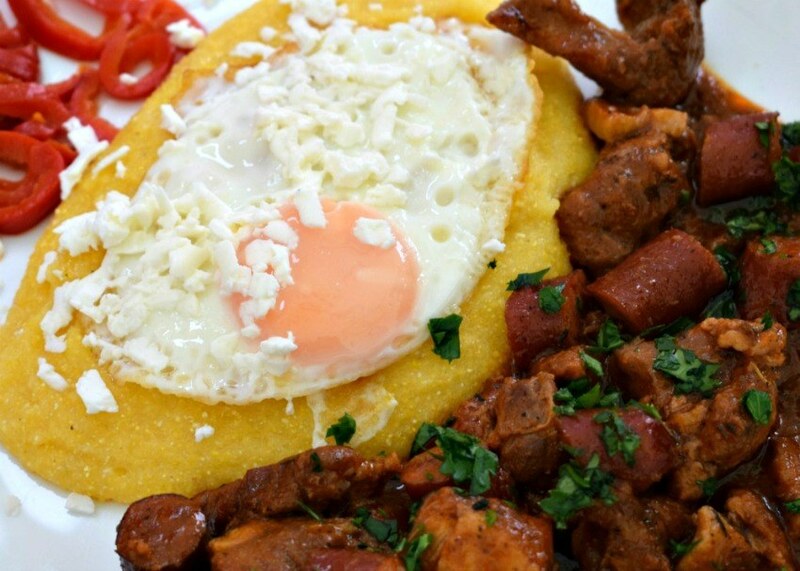 Polenta with fried egg, pork and local sausages, tocitura. Tocitura is by far my favourite Romanian dish and is a hearty filling meal. One Romanian dish I have to mention is what we call “pig fat on a stick”, to our Romanian friends and neighbours it is slanina and is much loved. To see how it is prepared and served see our post on lunch in the tuica shed. It makes an appearance at every Romanian BBQ or cook out. Sometimes they eat slanina raw with crisp onions. I pull the vegetarian card for this one! To see the slabs of pig fat coming off the pig, you need our post on pig butchery and slaughter. Fresh trout from one of the many pastravaria in Romania. Pastrav means trout and pastravaria normally have their own lake or stream from which your lunch will come. 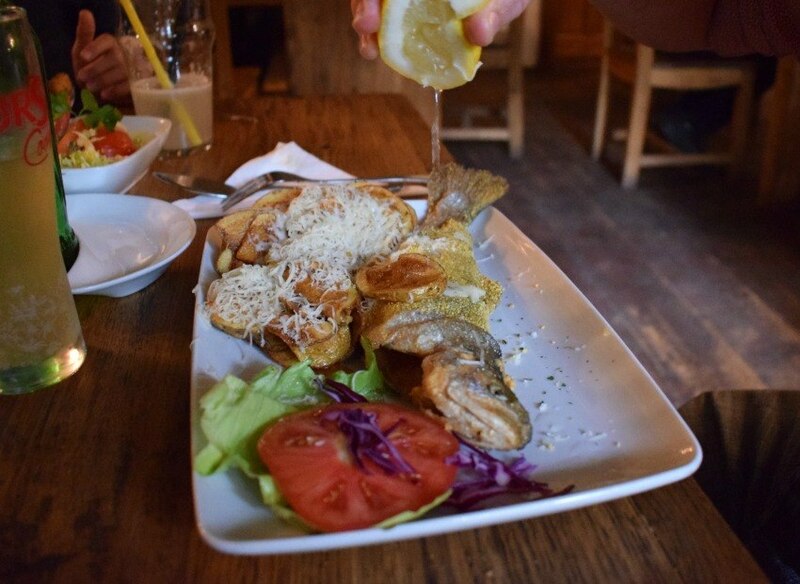 Trout is a Romanian speciality, look out for Pastravaria as you drive the mountain roads. This restaurant, Pastravaria Alex in Maramures, was superb. Romanian cheese may be sheep, cow or goat, with sheep’s milk cheese being particularly common. Hard and soft cheeses are made by local shepherds and their families. Sheep and goats make cheese in Romania. 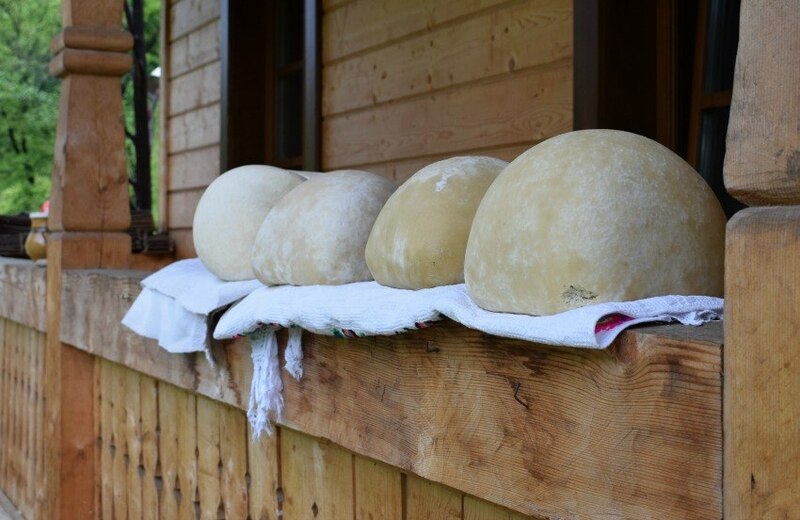 You will see these large cheeses at country markets. Sarmale cu mămăligă. 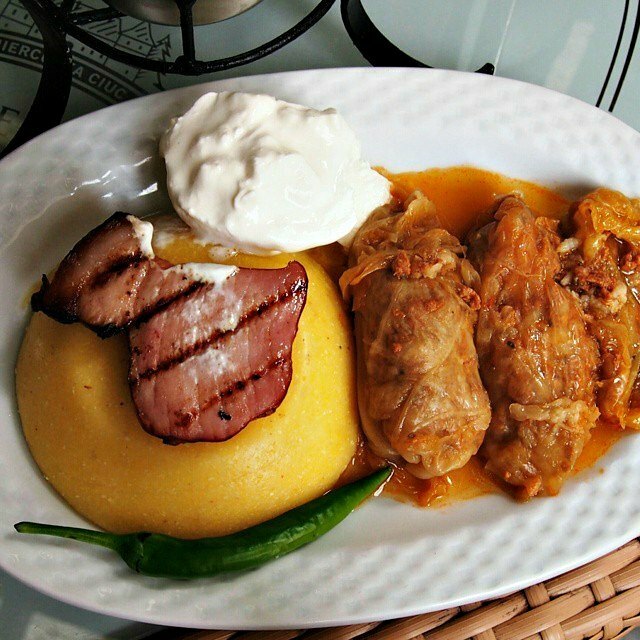 A Romanian national dish with stuffed vine leaves, polenta and sour cream with a slice of pork. This is just the start of our posts about traditional Romania food, there are many more to come, including those on wines, cheeses and traditional ingredients. Sign up to read more about Romanian foods to try and where to find them. 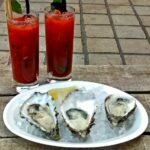 One of the things i really love to engage in whenever i’m in a new place is the local food.